Many of the questions that you get about horticultural matters have already been answered and posted to the Internet by someone and those answers can be found by a diligent search. However, it won't necessarily be easy. Hopefully I can provide some hints to better enable you to do this. Although these sites have similar names and much common information, they are not mirror images of each other so you should use both to find your answers. At the home page of each of these sites you will find links to many subject areas which will allow you to get to what you are looking for as quickly as possible. On the left hand side of the page you will find buttons to click on to take you to the desired section. Probably those that you will use most are Questions and Answers and Growing Info. Questions and Answers takes you to categories of answered questions that have been archived for your use. 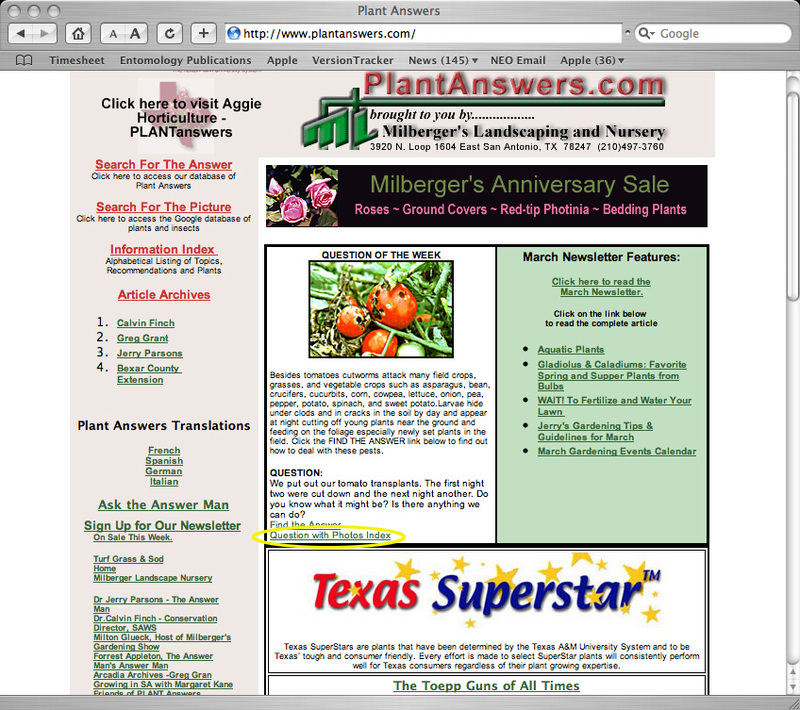 By clicking on one of these links such as Vegetables, you will find most of the vegetables grown in Texas listed and by clicking on the individual vegetable names you will find common questions and their answers. Growing Info will take you to a list of Publications covering many helpful subject areas. 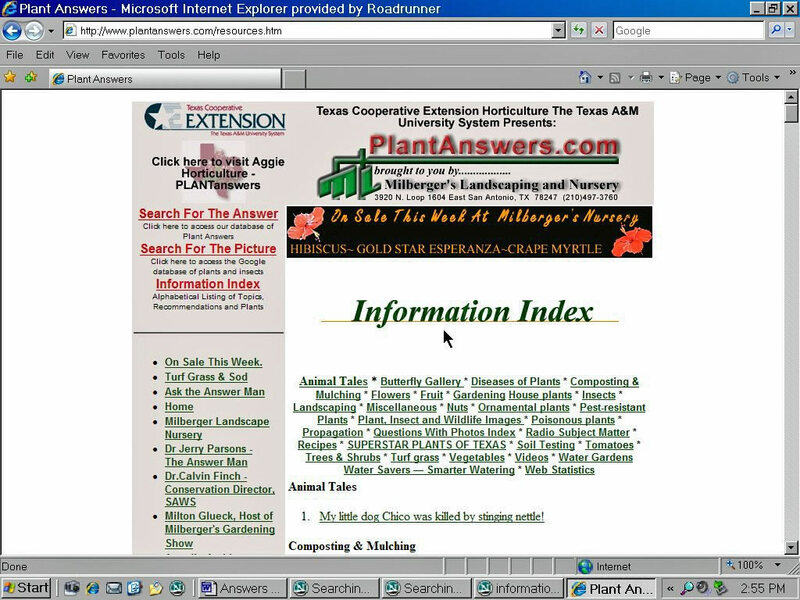 Plantanswers.com houses much of the same information as PLANTanswers.tamu.edu as well as over 7500 questions-and-answers received and answered by Extension and Research professionals of the Texas A&M University System since this site was started in October, 1995. Over 150 questions per month are received and answered. 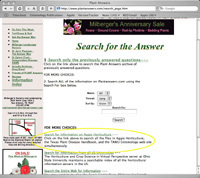 Those questions-and-answers not previously found on the database are entered on the archives at Plantanswers.com. Again, on the left hand side of the page you will find buttons which take you to the desired part of the web site. You will find the Information Index and the Search for the Answer to be most useful. The Information Index button will take you to a page that lists categories of information in alphabetical order by category. 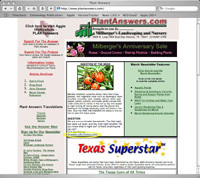 For example the category "Fruit" contains links to articles on all of the common fruit grown in Texas. Much of this information is identical to that found in Aggie Horticulture but is grouped in an easily found location. The Search for the Answer button will be discussed below. If you were unsuccessful in finding your answer using the links discussed above, you can use the Search function of these two web sites to enter the word or words that best describes what you are searching for. 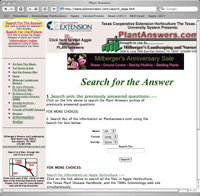 Starting with Plantanswers.com you will note that the first option, when you click on the Search for the Answer button, allows you to limit your search to the archived questions and their answers while the second option will expand your search to the entire website. The third option Search for Information on Aggie Horticulture takes you to the Aggie Horticulture Search Page. 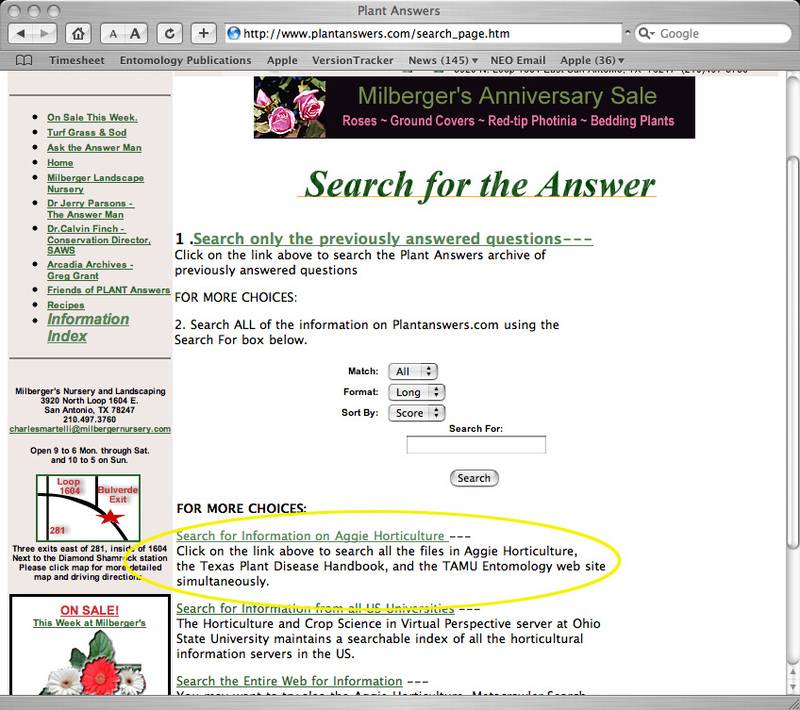 There you will find an Aggie Horticulture-Google Search Interface with a box which allows you to type in your search words and gives you the option of using Google to search Plantanswers.com, Aggie Horticulture or the entire web. I find this to be an invaluable tool as it allows you to search not only on words but also on phrases. If you enclose your phrase in quotation marks, Google will only return those pages with this identical phrase. This search technique is especially valuable if you know the botanical (scientific) name of a plant that you wish information on such as "Lupinus texensis". This search of the entire web returned about 31,500 responses in 0.10 seconds. Another great feature of Google is that once you have the responses to your word or words, there is a link at the top of the page that you can click on to see any images associated with your search. 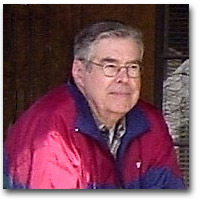 Plantanswers.com also houses weekly column archives of Drs. Jerry Parsons and Calvin Finch. These are accessible from the left side of the front page and are Searchable as they are added weekly and monthly. 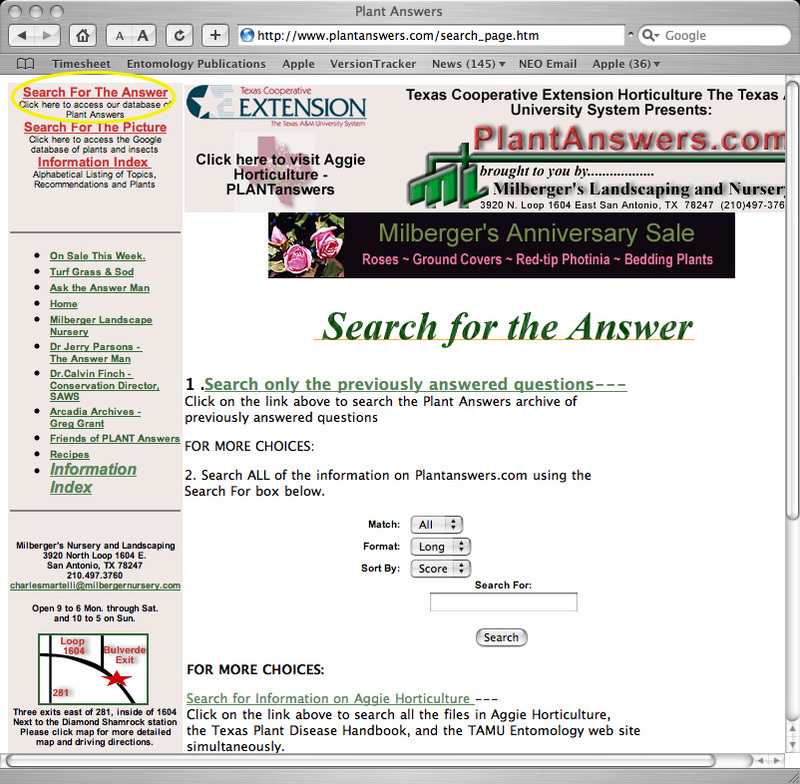 On the front page of PLANTanswers.com is a section entitled: Question with Photos Index which contains questions with photos. There is also a Search for the Picture section on the front page of PLANTanswers and in the SEARCH section of Aggie Horticulture-PLANTanswers which can be used to search for images to identify plants or plant related subjects. 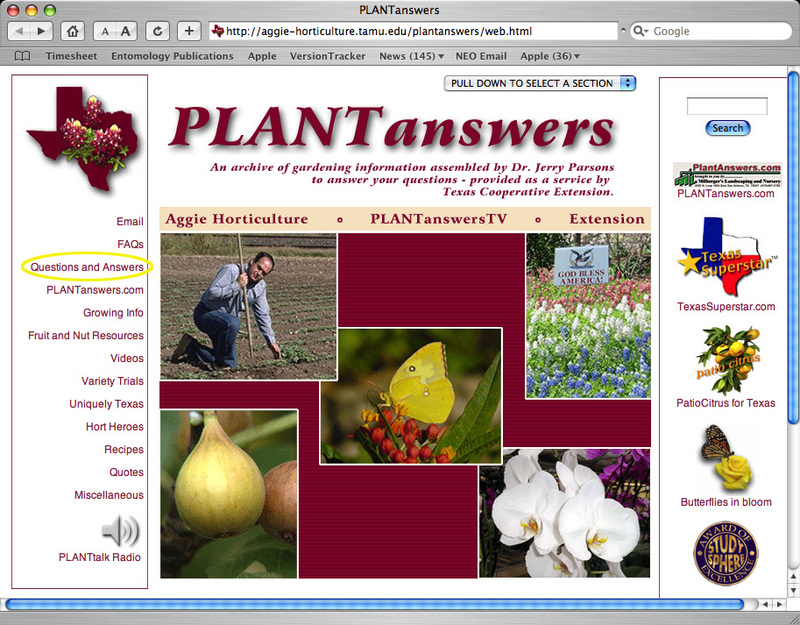 There are many horticulture and horticulture-related subject matter videos housed on Aggie Horticulture-PLANTanswers and linked as well to PLANTanswers.com. They are available in Real One and QuickTime format for slow modems and fast modems. These are the l-minute-and-30-second news spots which Jerry Parsons did while he was a regular on the CBS affiliate in San Antonio for 17 years. Forrest Appleton assists the Aggie Horticulture team by answering thousands of questions a year.